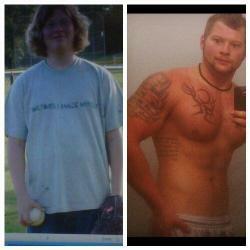 i was 14 in 8th grade i weighed 275 with barely any muscle mass, i was extremly out of shape. i was picked on a lot and was made fun of a lot. i played football but wasnt really good so one day i was just fed up with everything, i have had enough. i asked my parents for a weight set for christmas, when i got it i did my first workout even though i had no idea what i was doing but the day after i was so sore but i loved it. from there on out i became obsessed, as the years went by i was getting stronger and losing weight along with getting muscles and the reactions i would get from people at school was amazing. i became a lot better at football and other sports. near the end of my junior year of high school i began training some of my friends because i finally knew what i was doing and in months they were seeing changes as well, at that point i know what i wanted to do with my life. i wanted to be a personal trainer and change peoples lives around. i went from a kid that didn't know anything about training to the kid that set high school records and changed his life around. it took me longer to do that because i did it all on my own but with the knowledge i have now i can now help change anyone life around.